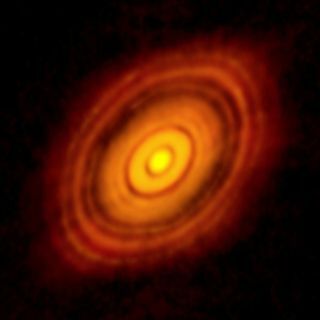 An ALMA image of the young star HL Tau and the disk of gas and dust surrounding it. New evidence suggests this is the first image ever obtained of planetary birth. A controversial space image does indeed show the first picture of planets being born, a new study confirms. When an image of the system HL Tau was unveiled last year, it sparked controversy over whether or not grooves in the disk of dust surrounding the star could be explained by the presence of newly formed giant planets. Now, a new paper suggests that the orbit of those planets could serve to stabilize rather than eject one another, as had originally been suggested. That means this image is the first time scientists have observed a forming planetary system, and a tightly packed one at that. "The big question is, are we really seeing giant planets carving out the disk out of which they are forming?" lead author Daniel Tamayo, from the University of Toronto in Canada, had said in a presentation at the Emerging Researchers for Exoplanet Science Symposium hosted at Pennsylvania State University in April. In October 2014, the Atacama Large Millimeter/submillimeter Array (ALMA) — a giant radio telescope in Chile — captured a puzzling image of HL Tau. Scientists immediately began debating whether planets were responsible for carving the gaps in the system, which lies about 450 light-years from Earth, in the constellation Taurus. Although they didn't take the original ALMA image, Tamayo and his colleagues set out to investigate whether planets could survive so close to one another. Planets massive enough to carve the close-fitting gaps at the outer edges of the disk would have enough gravity to scatter other close-orbiting neighbors, Tamayo said. When his team ran simulations with planets five times as massive as Saturn, things became eccentric, and at least one of the planets wound up ejected. However, Tamayo and his colleagues noticed something interesting about the outermost lanes. "These outer three gaps, the ones that are closest to one another, their locations are close to where you'd have a chain of 4:3 resonance," Tamayo said. In a 4:3 resonance, one planet would orbit the star four times for every three times its neighbor traveled around the star. These special orbits would just miss one another, allowing the entire system to remain stable over time. In Earth's solar system, the presence of a similar orbit allows Pluto to travel inside of Neptune's orbit but keeps the two from colliding. In its initial findings, the team argued that the resonances of the outer planets would keep their orbits elliptical. However, if these orbits were not resonant, the disk of gas and dust would make the orbits more circular. Soon after the original findings were published, the scientists who took the original image announced that the gaps were, indeed, elliptical. "I think that's really promising evidence that planets are what's responsible for these gaps," Tamayo said. Still, he cautioned, "It's not a slam dunk." However, a system of matched-orbit giants has interesting implications, he said. "If these are giant planets resonantly interacting, this is the most closely packed system of giant planets," Tamayo said. A system of close-orbiting massive planets may be stable today, but Tamayo and his colleagues questioned how it could have wound up that way. "It sets up a puzzle, and that's the puzzle of formation," Tamayo said. He described the special orbits as a cozy shelter, surrounded by a ring of fire of instability. "How do you slowly migrate across this ring of fire to get to this nice, cozy shelter?" he wondered. "It seems like we're in a jam." Massive exoplanets would be unlikely to move together without getting kicked out by one another's gravity. But the scientists realized that smaller planets had the advantage. If the planets were captured into resonance at lower mass, they would avoid the instability issue. Slowly, these smaller planets could grow together into bodies large enough to clear gaps in the cloud of dust surrounding the star. Tamayo and his team started with planets roughly five times the size of Earth. Their models showed that the smaller protoplanets could form and move into stabilizing orbits without knocking each other out of the young system. Over time, the merged bodies would continue to accrete the gas and dust while in their special orbits, clearing out their own paths as they grew into massive planets roughly the mass of Saturn. But the system can only remain stable so long, Tamayo said. Eventually, the planets will accrete enough mass that they will bump each other out of resonance, knocking the system out of control, he said. "This system is a ticking time bomb," Tamayo said.